At the end of March, that will be the number of minutes that passed during this first quarter of 2019. As the next quarter kicks off, how would you like to 10x your productivity in just one hour? Chances are, you set some pretty fantastic goals for yourself in January. What if you used that hour to get those big dreams moved from “wishing” to action? You simply use a time hack I call the Power Hour. The thing is, we all have a certain time of day that is most productive for us and in which we do our best work. For me, it’s early morning. I know from 5:00-6:00 am every day I do my best work. I plan that hour accordingly ahead of time so I always know exactly what I will be working on. I’m not going to lie, doing so has required some sacrifice. I get up at 4:45 am every day so I am ready to work by 5:00 am with a hot cup of coffee in hand (because that is one sacrifice I am not willing to make). Also, I had to change my workout to the evenings after I put my kids to bed because I am not willing to lose my most productive time for something that doesn’t require brain power. What I am able to get done weekly because of the Power Hour? Want to try a Power Hour? Plan ahead. As in… plan ahead of time what you are going to do with that time. That’s the beauty of a Power Hour. It is your time and you can plan it anyway you like. Think back to your MOST productive days ever… chances are you were on deadline, about to go on vacation, or had set meetings during the day and time chunks in between where you were working on fixed time constraints. Yet this method doesn’t have to be reserved for the day before vacation or random meeting days. You can and should work to the clock to get more accomplished every single day. I mapped out exactly what is happening during my Power Hour every single day for weeks to come. This strategy keeps my target goals on track and my dreams moving from wishes to accomplished. Planning on implementing a Power Hour? Let me know in the comments. 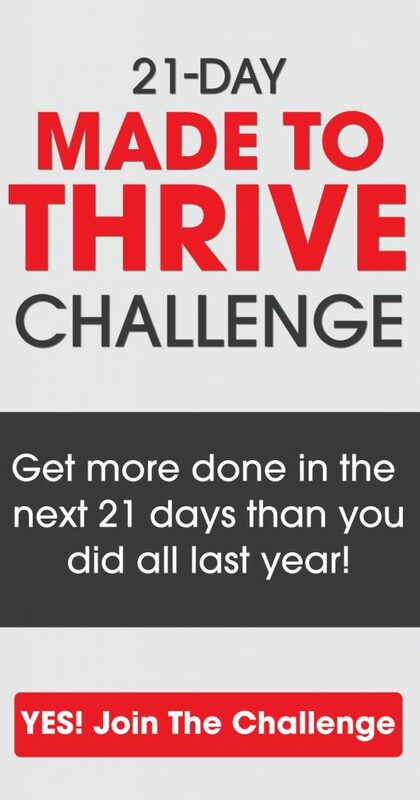 And if you want to up-level your productivity and make your dreams become accomplished goals, check out our Made to Thrive Challenge Here. I recently started a Power Hour but was unsure what I was doing and as such my time was usually squandered. But now I will plan ahead what I am going to do and get productive. This whole planning thing seems to be a common thread with the successful people. Planning is now my middle name. I agree! Great article, I am going to switch my workout to later in the day when I tend to hit a wall and do the power hour in the morning when I am more productive. Exactly what I do, Lou. Glad it was helpful. me with a link for creating a new password. So happy this is helpful, Teresa. Thanks, Kim – I usually do my workout and then my planning first thing in the morning, usually starting at 6 AM. This week I am going to move the workout to the late afternoon and plan our my power hour the night before – so I will know what exactly I will be working on before hand. How’d this work out, Cathy?